Zoom allows for iOS screen sharing from iPhone and iPad, using the Zoom desktop client. 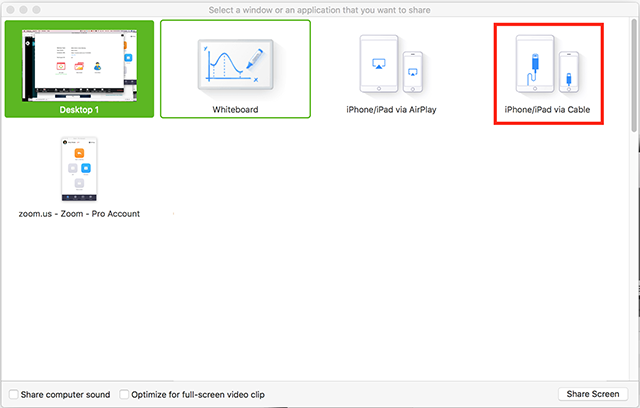 You can share wirelessly for both Mac and PC, utilizing iOS Screen Mirroring, or you can connect your iOS device to your Mac computer with a cable to share. You can also share your entire iOS device screen using Screen Recording on iOS 11 or later. Learn more. Note: Some types of videos cannot be shared when using Screen Mirroring. *You will be prompted to download this the first time you choose to share your iOS device via Airplay, or you can download it manually from the Download Center. In your meeting, click Share Screen. Optional: If you would like to share your phone audio into the meeting, check Share computer sound. If prompted, choose to install the plug-in. Follow the instructions to connect your iOS device. On your phone, swipe up to access the control center. Choose the Zoom-your computer option. Your phone is now shared into the meeting. Note: Sharing with a wired connection is only possible on Mac. Connect your iPhone or iPad via cable. When prompted on the iOS device, select Trust.